In celebration of the recent launch of Surf-Fish.com , I thought it would be worthwhile to revisit some of the basic principles of surf fishing. It is immensely confusing to new fishermen and women , especially if they hit the beach and see 12 foot rods being used. It is possible to ease into the sport , so let's look at some basic gear requirements first. It takes a certain amount of practice to cast a 12 foot rod with accuracy and consistency , so start smaller. You can find smaller surf combos in the 8-9 foot range that will be much easier to cast at first , but will still be able to handle the occasional big fish. Look for a catfish or surf combo , with a bigger reel. These can be found at Wal Mart , BassPro , and most tackle stores. These are mainly Medium Heavy (MH) rods rated for 1-4 ounces of weight , and up to 20 pound line. This setup will become your go to rod for lighter duty surf fishing , so it is worth spending a few more dollars to get a nicer rod and reel. I recommend using a spinning reel unless you have lots of experience with baitcasters , as a 4 ounce sinker will cause backlashes unless you know how to cast. A spinning reel that will hold 150-200 yards of 17 or 20 pound test line is perfect for an 8-9 foot rod. Fishing line for surf or pier fishing is heavier than what most people are familiar with. It can be either braided line or monofilament , but in certain places braid is frowned upon. On piers and at crowded fishing beaches , high visibility 17 or 20 pound monofilament is probably the most commonly used line here on the East Coast of the U.S. , but you can get by with just about any type of 17-20 pound test line. Anything lighter will necessitate the use of Shock Leaders , and anything heavier will severely limit the line capacity of your reel. Braided line is popular in some places , and most people will use 50 or 60 pound braid. There are drawbacks to using braid , just as there are with mono , but it does have it's advantages. Just make sure braid is acceptable where you plan to fish before you spend the extra money. Mono is welcome everywhere. Rigging is my specialty. I know all manner of rigs for targeting specific fish , and I tie my own in most cases. Different rigs are required if you want to target specific fish , but there is only one that you should concern yourself with when first starting out in the surf. Unless you are good with knots , and have the patience to learn at least one new knot , I recommend that you buy rigs for your first trip. They are usually inexpensive , and they are a staple at every beach tackle shop and pier house I have ever been in. 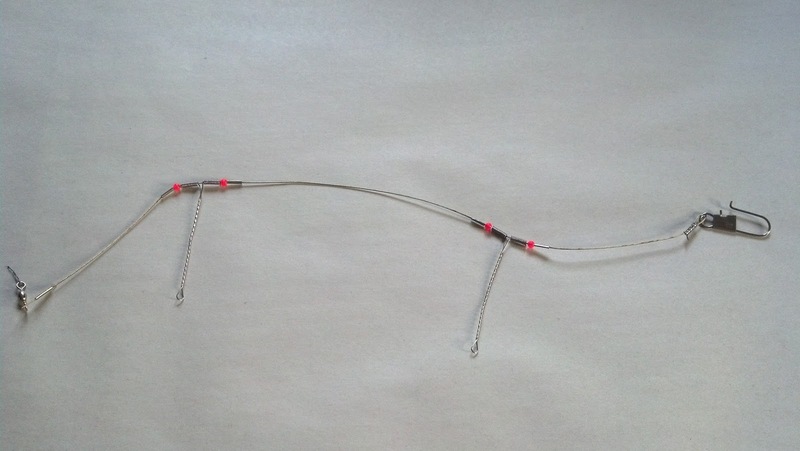 The most basic rig you will use is a two hook bottom rig. It is without a doubt the best surf rig you can start with , and probably the most commonly used. Every surf fisherman will use this rig , or some variation of it , at some point. They are made by several companies , tons of local businesses , and even at home by frugal fishermen. In the picture below , you'll notice a few things : it's a short piece of wire with two twisted loops for attaching hooks , a swivel or loop to attach your main line to , and a swivel and snap on the end to attach a sinker. Some tackle shops sell these with hooks and sinkers already in place , but bigger stores usually carry them plain to allow you to choose how you want them rigged. 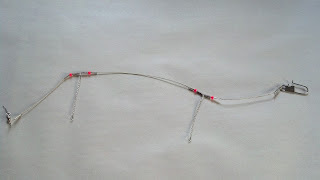 To use this rig , you will need : snelled hooks (size 2 or 3 long shank is a good starter size) , and a sinker. It's best to tie the rig to your main line first using a reliable knot like the Palomar Knot , then add the sinker (2-3 ounces for most situations) , followed by the hooks. If you've bought a rig with the hooks already attached , I recommend using an Improved Cinch Knot , but use whatever you are comfortable with. If you are familiar with freshwater fishing , you'll be a little surprised by the large lead weights used in the surf for pan fish. The heavier line , the big rigs , and the waves all make it necessary to beef up your weight. If the ocean is relatively calm , 2-3 ounces is all you should need , but i have used as much as 8-10 ounces when targeting big species with a 12 foot rod. Starting out , all you should need is a handful of 2 , 3 , and 4 ounce sinkers. They come in several different styles , and most anglers will eventually find a favorite. In the picture below , you'll see a sample of 3 common East Coast standbys. Welcome to Surf Fishing for Beginners' new home , Surf-Fish.com ! I've been dragging my feet on this one for so long , but now I finally have a shiny new domain. It has a nice ring to it , I think. I'm really excited to get back to writing on this site , and making more how to's for those that want to break into Surf Fishing. There's a simple joy in standing on the beach and catching fish , and I've always enjoyed helping others experience it for the first time. Most of what you'll see here is specifically from my experiences on the East Coast of the U.S. , but a lot of the same basic principles apply world wide , so give it a try! For now , check the archives to the right for the older articles that cover the basics. There is a lot of useful info in there!